Somehow this post has been lost in the abyss that is my blogging folder. Written over a year ago, it’s nigh on time to share it with you. And fitting too – we’re off down the coast for a few days, staying at a friend’s holiday shack. 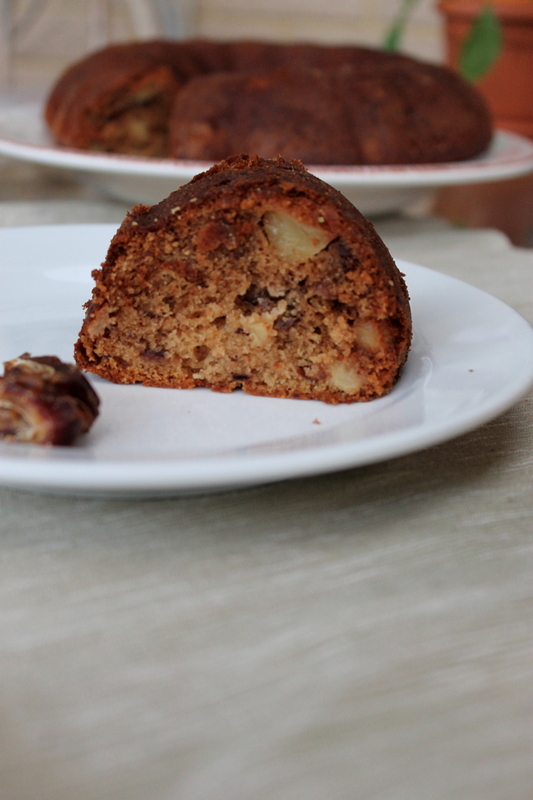 We undertook a similar venture this time last year and among the many items we baked to take with us, this Apple and Date Cake was one of them (only thing was it didn’t last long because we were all too greedy). Although it won’t be accompanying us on this particular trip who knows, we may make it down there – the ingredients will most certainly be packed for if the right time arises! 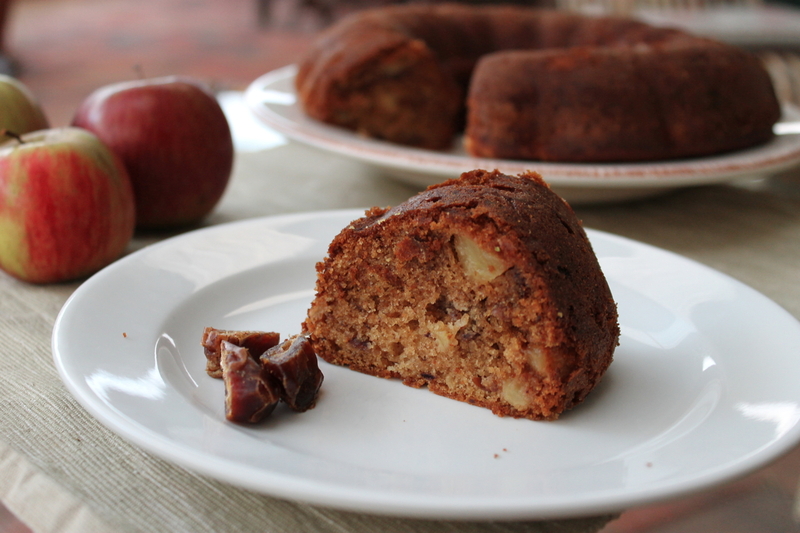 I distinctly remember requesting this Apple and Date Cake for my fifth birthday. I also remember pestering my mother to allow me to help my grandmother bake it. 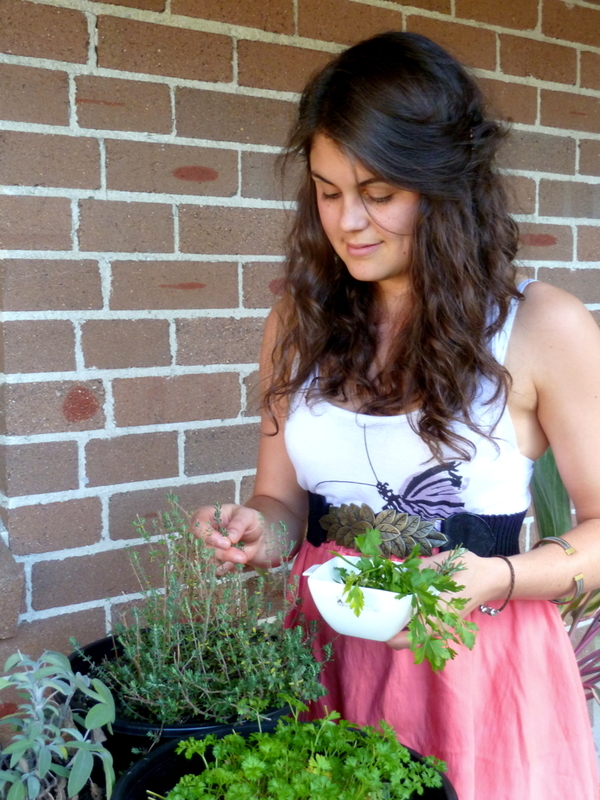 To sit on her kitchen bench and stir the mixture. To stick my fingers in it when she was greasing the love heart cake tin I’d asked her if I ‘pretty please could have’, happily licking the batter off them as she traced out the heart shape on baking paper. 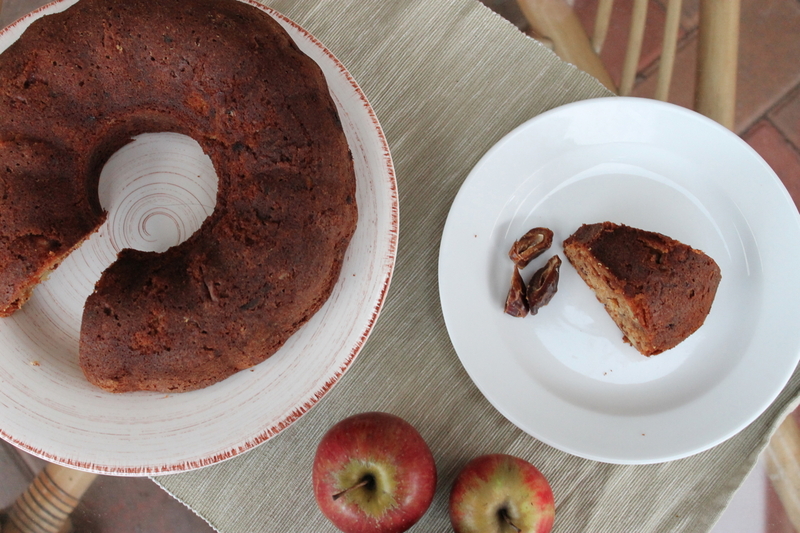 While all my other friends were having ice-cream cakes or chocolate cakes at birthdays, for years I had this Apple and Date Cake. Boy was I proud of it. And rightly so, for this is a Granny Brampton ‘specialty’. Despite diligently re-writing many of the recipes I have been given over the years into a nice folder, I’ve been unable to part with the copy of Apple and Date Cake that Granny wrote out for me. I don’t think I ever will. Sweet, moist, delicately spiced with cinnamon and dotted with chunks of apple – neither crunchy nor mushy but ‘just right’ – it’s a guaranteed people pleaser. You might think well she says that about every dish. This one’s different. Honestly. Despite the moist crumb, this cake keeps surprisingly well – it may be refrigerated for up to five days. Simply bring to room temperature or warm slightly in the microwave before serving. Serve as is, or with a smidge of whipped cream or dash of caramel sauce if you’re feeling extra indulgent. It’s a hit with all ages and occasions- from a five year old birthday girl, to a group of college students cleaning the whole thing up within minutes in a make-shift couch and blanket ‘cubby’, to seaside road trips. You can’t deny that it’s been well tested! Preheat the oven to 175C. Grease and lightly flour a capacity bundt tin. *Note that the cake can be baked in a regular springform tin – it may just be moister in the centre. Place the apples, dates, bicarbonate of soda and boiling water in a medium sized bowl. Stir well and leave to cool for 15-20 minutes. Once at room temperature, drain the mixture, reserving 1/3 cup of the liquid. Alternatively, if you have the time, leave in the fridge over night and the dates will absorb all the liquid! Sift together the flour and cinnamon. Set aside. Beat the butter in a large bowl until creamy. Add the sugar and beat until very light and fluffy. Gradually add the egg along with about a tablespoon of the flour, beating well after each addition. Now fold in a third of the flour and then half of the fruit mixture and some of the reserved liquid. Fold in the next third of flour, the remaining fruit mixture and reserved liquid and then finally the last third of flour. Spoon the mixture into your prepared pan and bake for 35 to 40 minutes or until browned on top and a skewer comes out clean when inserted. Set the pan on a wire rack and leave to cool for 25 minutes. Carefully remove the cake from the pan and leave to cool completely on the wire rack. Source: Adapted from Granny Brampton’s recipe.